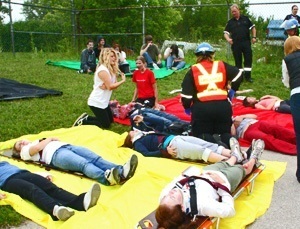 Triage kits are essential to organizing the scene of a disaster. From natural disasters to major car accidents, to fires, and more, a triage kit will help first responders to keep order among the chaos, prioritize the needs of survivors, and get to work administering life-saving aid. Color coded tarps, tags, and tape go a long way in directing medical personnel and victims alike. By properly organizing the efforts of trained medics, trauma kits can greatly improve the effectiveness and reach of treatment efforts. Shop for comprehensive triage kits, or buy triage materials separately to add to your existing supplies. This set of 4 Triage Tarps measure 16' x 20' and are made of 5 millimeter thick vinyl w/ grommets. They come in four different colors: Green - Minor Yellow - Delayed Red - Immediate Black - Morgue Includes convenient carrying case. This set triage tape comes with 4 rolls. Each roll is 200' long and comes labled as follows: Red - First Priority - Immediate, Yellow - Second Priority - Delayed, Green - Third Priority - Minor, Blue - Fourth Priority - Morgue.